It takes me all of three minutes to fall over in the car park of Skellefteå airport, narrowly avoiding sitting in an icy puddle. I have brought walking boots and sensible trousers, but they’re in my suitcase which has seemingly (and quite understandably) decided to stay in the relative warmth of Stockholm. The Sami retain a distinct identity across Lapland, with many choosing to continue living a relatively traditional way of life, based around coastal fishing, fur trapping and reindeer herding (though not to the exclusion of useful modern innovations – most reindeer herders use GPS these days). Like so many indigenous people throughout the world, the Sami have historically had a pretty raw deal at the hands of the dominant cultures, particularly in Norway, where basic inequalities in areas such as education are still being addressed. As we drive north into the countryside, I catch glimpses of the kind of scenery one associates with Lapland from childhood Christmas cards; snow-laden pine forests, dotted with brightly coloured wood-clad cottages, smoke curling up from their steep-pitched roofs. While we’re not quite into the arctic circle here, I feel every one of the 1500 miles between me and London. Our beer schedule for the next couple of days is pretty full, so we waste no time in heading for our first destination: Skellefteå Bryggeri, on the waterfront of the town from which it takes its name. The brewery is a compact but slick operation, with its own taproom and waterfront restaurant. With drinkability as its primary goal, Skellefteå’s beers are all very accessible. Head brewer Per Lundmark has worked closely with a Czech consultant, from fitting out the brewery to creating the line of beers. Interestingly, he says that having a lager or pils is pretty much obligatory for a brewery to be commercially successful in Sweden, unlike the UK where such styles still don’t have the best reputation. While the two lagers – sold under the Brackens and Kallhoman brands – are the standouts in the range, Skellefteå’s other best sellers are, bizarrely, a bitter and a mild. I ask Per whether Swedish drinkers have a passion for traditional English styles that I’d somehow missed. He laughs and explains that these are the styles he supplies to Sweden’s state-run monopoly bottleshop, Systembolaget. Set up in the 1950s, as an alternative to the deeply unpopular alcohol rationing system in place since the Second World War, Systembolaget is the only way to buy alcohol in Sweden aside from bars and restaurants. This is a blessing and a curse. It can make it very hard for small brewers (particularly those in areas with a small population, as is the case in the north) to expand beyond their local area, and often seems to dictate those breweries’ priorities. In the case of Skellefteå for example, there was a gap on the shelves for bitter and mild, and Per won the competitive ‘offer’ to fill the gap. Viewed positively though, it provides a channel for small brewers to get their beer in front of a mass audience, and has a legal obligation to source drinks, locally or internationally, if consumers request them. Certainly for Skellefteå, this is a huge bit of business which, while tying up much of the brewery’s capacity, has also provided predictability and credibility (the Systembolaget buyer apparently once said of Skellefteå “England’s best brewery is in the north of Sweden”). Bidding Per good night, we eat at Restaurang nygatan 57, a small, laid back place in town, which specialises in beer matching. I choose a very traditional northern Swedish bleak roe with crème fraiche on toasted flatbread. I mention this not because I’m the sort of person who Instagrams their every meal, but because it happened to be paired with a truly outstanding lager from the nearby Southside Brewing Co. The next day, we were back on the road, in search of Southside’s rural brewery. Like the other towns I visited in Swedish Lapland, Skellefteå’s industrial heritage is still apparent, particularly on the outskirts. Steel and paper mills sit alongside more traditional industries like fishing, and remain a major source of employment in the region, and a common presence on its landscape. Southside Brewing Co. is in a pine forest at the end of a dirt track between Skellefteå’s industrial belt and the countryside beyond. Its founder, Tommy Eriksson, gives us a warm welcome into his small brewery; a converted garage where brewhouse, refrigeration, manual canning and bottling lines all sit cheek-by-jowl. Tommy is a fascinating character, having returned to Sweden only last year to pursue his brewery plans. Prior to this, he had spent 20 years in California, building NASCAR racing cars for a living and working at a craft brewery. He’s brought a lot of his American style and knowledge back with him, creating beers with a distinctly west coast character. As well as the lager that impressed me so much, he has an IPA, a red ale and a knock-out blonde stout. Tommy says his creations have been well received by Swedish drinkers, who are surprisingly sophisticated given that craft brewing is a relatively recent phenomenon here. Our next stop is Piteå, a town about 50km north of Skellefteå. Before descending on Pitea Bryggeri though, we decide to take a small detour. Tweeting throughout the first day of our adventure, Hakan had struck up a conversation with a home brewer, Magnus Holm, who invites us to see his setup and talk beer. Magnus has been brewing for six years, having got the bug from his father. 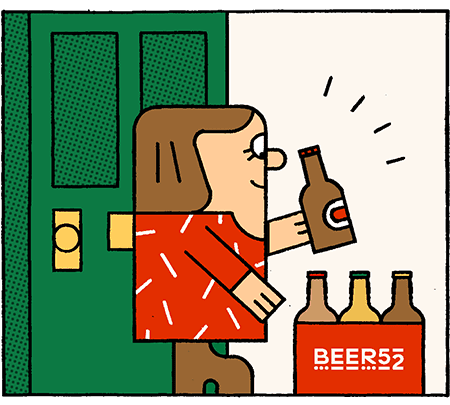 In a domestic situation familiar to home brewers the world over, Magnus’s hobby has seemingly become an integral part of the house, with every cupboard, nook and crevice given over to brewing. His main fermenting space is in the snug and temperature-regulated confines of his home sauna. I’m impressed by both the range and the quality of Magnus’s beers, which include a Brett & Rye Saison, Call me Pixie (a holiday pale ale) and a Vanilla Milk Stout. I particularly enjoy an unctuous imperial stout that he retrieves from the crawl-space under his utility room. Whereas his father brewed pretty much in isolation, Magnus is part of a now-thriving homebrew scene. Like everyone I would meet in Swedish Lapland, Magnus is absurdly generous, both with his time and his beer, and I left somewhat tipsy. We arrive at Pite Bryggeri in the centre of Piteå some time later. Set in the vaulted vegetable store of an old asylum, the brewery and taproom have oodles of atmosphere. Diners at the candle-lit tables can watch head brewer Jörgen Bergstedtat work through floor-to-ceiling glass windows. Jörgen explains that his initial plans for a much more modest operation quickly escalated once he got started. Asked whether he had ever considered setting up shop in the more densely populated south of the country, Jörgen doesn’t hesitate. The final stop on our tour is the town of Luleå, almost in the arctic circle. Sat on the northmost shore of the Gulf of Bothnia, it’s cold enough in November for skaters to be zipping around the ice-bound ships in the harbour. I’m here to visit two final breweries, both of which are definitely at the ‘nano’ end of the commercial craft scale. Bottenvikens Bryggeri makes an interesting first impression. Entry is through the main door of a modern apartment building in the very heart of the city, through a fire escape, then down a series of interminable and entirely featureless corridors. Just when you’re beginning to wonder whether this is in fact an anxiety dream, brought about by non-stop drinking and lack of daylight, a nondescript door announces you have reached Bottenvikens Bryggeri. The brewery itself is just about big enough for a tiny brewkit on a home-made wheelie trolley, a bottle fridge and some work surfaces (and a 3D printer, for reasons that are never fully explained). But the excitement in the room is palpable. Joakim Nilsson and Mattias Bergström are so intensely passionate about what they do that it’s hard not to be carried along by it, despite the uninspiring setting. Every beer they produce is a one-off, with a run of around 240 bottles sold primarily in local bars and restaurants (the only time they’ve sold in a Systembolaget, the stock ran out in minutes). Every beer also tells a story, brewed to evoke an experience unique to the area and its culture; each label (designed by Joakim) bears a poem (written by Mattias) to help convey the beer’s deeper story to the drinker. This may seem a little pretentious for a beer, but there’s no pretence here. It’s clear that the pair think deeply about everything they do; even as they answer my questions, they are bouncing ideas off each other and debating. It seems to be their natural mode. And, even if the poetry and cultural signposting isn’t for you, it’s hard to fault beers this good. The end of the road is the Bishop’s Arms pub in Lulea, or more specifically a rarely-used kitchen in its sub sub-basement. The Bishop’s Arms is an unusual beast: a nationwide, British-themed chain pub – complete with mock Tudor beams and brass-plated nauticalia – which prides itself on its expert bar staff, eye-watering selection of single malt Scotch whiskies (which the Swedes love) and tap after tap of superb craft beers. Northern Lights is the Bishop’s Arms’ in-house craft brewery in Lulea. With a rolling selection of beers, ranging from pilsners to double IPAs to saisons, Northern Lights is a true one-man band, brewing on a scale similar to Bottenvikens. Jorhel Bercil has been brewing for many years and is well known among the close-knit community of craft brewers in Lapland. Softly spoken but clearly passionate, he talks with great affection about his customers and his peers. As we’re chatting, he reaches into the back of his cold storage, for what he reveals is the last remaing bottle conditioned saison he brewed last year. Taking the first sip, Hakan’s eyes light up and a broad grin spreads across his face. I know how he feels. It’s been a strange journey, skirting the Swedish Arctic circle, taking in everything from the slick and stylish to the cerebral and philosophical. Somehow though, sitting on a worktop with new friends in an eerily silent hotel kitchen, savouring the aged, Champagne-like saison seems a fitting end to our journey.